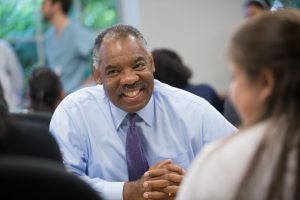 Paul Godley, MD, PhD, MPP, UNC School of Medicine’s Vice Dean for Diversity and Inclusion, passed away Sunday, March 31. Dr. Godley became the UNC School of Medicine’s first Vice Dean for Diversity and Inclusion in 2017. In this role, Dr. Godley oversaw the School of Medicine’s efforts to build a diverse and inclusive work and learning environment. Prior to this role, he served as Executive Associate Dean for Faculty Affairs and Associate Dean for Finance and Administration. While serving as Executive Associate Dean for Faculty Affairs, Dr. Godley, along with Dr. Amelia Drake, co-founded The Academic Career Leadership Academy in Medicine (ACCLAIM) program. The one-year program provides leadership training and career development opportunities to faculty members, with a particular emphasis on those underrepresented in medicine. More than 100 faculty members have completed the program since it was founded in 2012. As the Rush S. Dickson Distinguished Professor of Hematology/Oncology in the Department of Medicine and a UNC Lineberger member, Dr. Godley dedicated his career to researching and treating prostate cancer. He also worked tirelessly to identify, understand, and eliminate racial health disparities, directing the Program on Ethnicity, Culture, and Health Outcomes (ECHO). This UNC-wide initiative uses multidisciplinary research, education and training, and community partnerships to advance understanding of racial health disparities in order to eliminate them. In his spare time, Dr. Godley was an avid traveler and passionate photographer. Photographs of people taken during his travels lined the walls of his office. In this 2012 video, he discussed his love of photography and how it related to his work as an oncologist. Dr. Godley grew up in a home where health care was front and center. His father was an internist, and his mother was a nurse. When he attended Yale University as an undergraduate, his sister was in medical school. As he was earning his medical degree from Harvard Medical School, his mother died of colon cancer, which influenced his choice of medical specialty and sparked a research interest in cancer prevention. Dr. Godley earned a Master of Public Policy degree from Harvard’s John F. Kennedy School of Government. He completed his internship and residency at the Case Western Reserve University Hospitals, University Hospitals of Cleveland and the Cleveland VA Medical Center. He came to UNC in 1987 for a research fellowship in cancer epidemiology, earning a PhD from the UNC Gillings School of Global Public Health in 1993 and completing his subspecialty training in hematology and oncology at the UNC Medical Center. Dr. Godley’s loss will be felt deeply across the UNC and Chapel Hill community, where he and his family have many connections. His wife, Dr. Adaora Adimora is a Sarah Graham Kenan Distinguished Professor in the Department of Medicine. Their daughter, Bria Adimora Godley, is a student at the UNC School of Medicine, and their son Alegro Adimora Godley, works as an accounting technician in UNC’s Department of Political Science. A funeral service for Dr. Godley will be held April 6 at 1 p.m. in the main sanctuary of World Overcomers Christian Church, 2933 S. Miami Blvd., Durham, NC 27703. Instead of flowers, Dr. Godley’s family would appreciate contributions to: The Southern Coalition for Social Justice or The American Cancer Society. For those who would like to send flowers and/or cards, please send them directly to Walker’s Funeral Home, 120 W. Franklin St., Chapel Hill, NC 27516. A full celebration of Dr. Godley’s life and accomplishments is planned for the fall.